Wash. Full service is anticipated by fall of 1982. The facility will include an off- shore 21-acre marshaling yard that will connect to shore by a 1,500-foot-long pile-supported trestle. The marshaling yard-to- dock connection calls for two 200- foot orthotropic steel box girder bridges capable of handling two lanes of truck traffic as container ships and barges are unloaded. The floating container dock, to be anchored by eight 600,000- pound concrete blocks, will re- quire that the bridges be designed for a 22-foot tidal variation. Wash. It will employ a combina- tion of precast and cast-in-place construction. The multi-celled sections will be post-tensioned throughout. 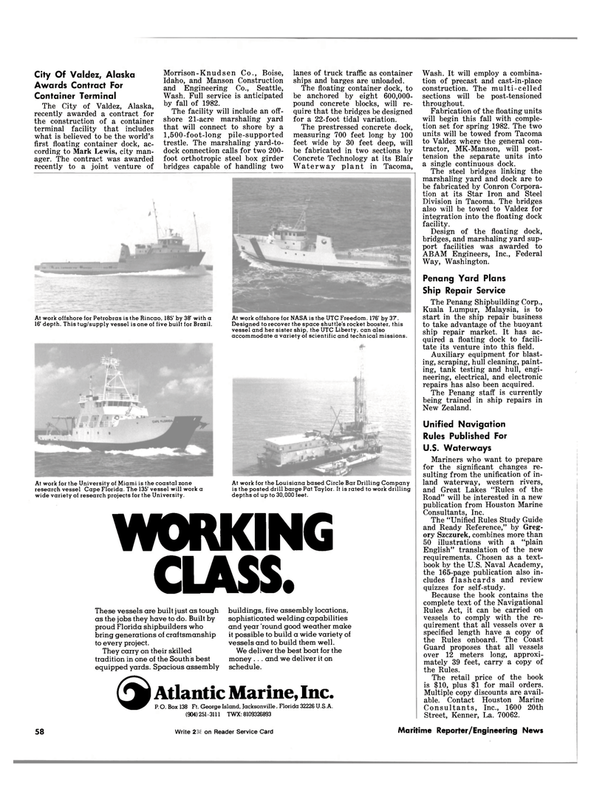 Fabrication of the floating units will begin this fall with comple- tion set for spring 1982. The two units will be towed from Tacoma to Valdez where the general con- tractor, MK-Manson, will post- tension the separate units into a single continuous dock. Division in Tacoma. The bridges also will be towed to Valdez for integration into the floating dock facility. Kuala Lumpur, Malaysia, is to start in the ship repair business to take advantage of the buoyant ship repair market. It has ac- quired a floating dock to facili- tate its venture into this field. Auxiliary equipment for blast- ing, scraping, hull cleaning, paint- ing, tank testing and hull, engi- neering, electrical, and electronic repairs has also been acquired. English" translation of the new requirements. Chosen as a text- book by the U.S. Naval Academy, the 165-page publication also in- cludes flashcards and review quizzes for self-study. Guard proposes that all vessels over 12 meters long, approxi- mately 39 feet, carry a copy of the Rules. The retail price of the book is $10, plus $1 for mail orders. At work offshore for Petrobras is the Rincao, 185' by 381 with a 16' depth. This tug/supply vessel is one of five built for Brazil. At work offshore for NASA is the UTC Freedom. 176' by 37. Designed to recover the space shuttle's rocket booster, this vessel and her sister ship, the UTC Liberty, can also accommodate a variety of scientific and technical missions. At work for the University of Miami is the coastal zone research vessel Cape Florida. The 135' vessel will work a wide variety of research projects for the University. At work for the Louisiana based Circle Bar Drilling Company is the posted drill barge Pat Taylor. It is rated to work drilling depths of up to 30,000 feet. These vessels are built just as tough as the jobs they have to do. Built by proud Florida shipbuilders who bring generations of craftsmanship to every project. They carry on their skilled tradition in one of the Souths best equipped yards. Spacious assembly buildings, five assembly locations, sophisticated welding capabilities and year 'round good weather make it possible to build a wide variety of vessels and to build them well.